WBC is supporting a series of upcoming workshops hosted by the Cambridge Business Forum, Destination: High Street on the 20th May. The workshops include discussions on current industry hot topics such as how local retailers can use social media to increase footfall and sales, space planning, negotiating with suppliers, and exploring retail trends. All good stuff, and stuff we at WBC are pleased to get behind. Not only is our very own Vhari Russell (Food Marketing Expert) involved, but this is an initiative brings together local people, local businesses and local issues. It will impart a bunch of practical knowledge; the retail weapons and new technologies that will keep our high street alive. Safety in numbers guys! So if you’re in Cambridge (or near abouts), don’t hang about – click below for more information. Based in Weir Road Wimbledon, Vallebona has established itself as one of the top Italian food suppliers in the capital as well as the leader of wholesale artisan Sardinian produce. Situated in an industrial estate slightly off the beaten track, footfall has been very much dependent on trade walk-ins. In recent months, Vallebona has seen an increasing consistency of custom, including non-trade clientèle, due to positive word of mouth. Vallebona saw an opportunity to expand the business when an industrial unit next door became available, offering a vast empty space that needed filling. They enlisted the help of WBC & the Metamorphosis Group to ensure the additional space was fully utilised; increasing commerciality by raising the average transaction value. Here are some of the pictures – their before and after. See how we used props and vintage retail display fixtures to turn an unused space into London’s newest indoor pop-up Sardinian marketplace. Where do wicker baskets come from and how are they made? Few things in life are quite as indulgent as receiving wicker baskets filled to the brim with lots of gifts you’d never think of buying for yourself. It’s the ultimate luxury. 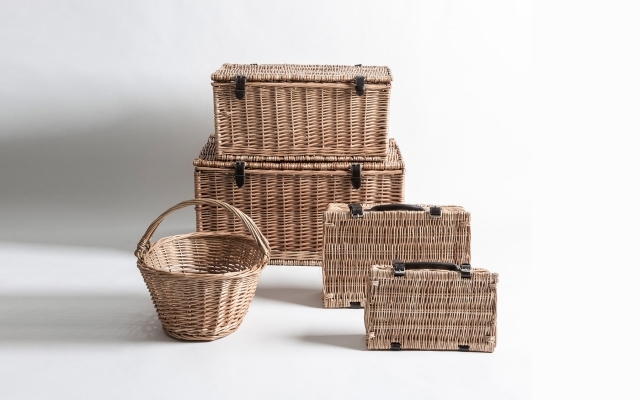 Traditional wicker baskets still account for a remarkable level of sales in the UK. Of the Independent’s 10 best Christmas hamper companies in 2012, WBC still supplies 7 of them; quality wicker is very much in demand. Some of wicker’s popularity can be attributed to its ongoing use – when you send a wicker basket, you’re sending two gifts for the price of one! Even more clever than that, wicker is environmentally sustainable and the perfect cash crop, which is great news for us eco-warriors. We investigated how wicker is made and what it’s made from, and found a bunch of hidden benefits that explain why it’s still a WBC must have product. It has felt like summer may never actually come. But if you look out your window and squint your eyes really tight, you’ll see firm evidence that at least spring may finally be on its way. It has to be. Regardless, National Gardening Week isn’t going to wait. It’s just one of a list of national awareness days that can serve as great ways (or legitimate excuses) to capture your customers imagination; and it’s not too late to get involved. We’ve put together a simple collection of green-fingered gift packaging ideas like wicker garden trugs and forest green jute bags. With just the smallest amount of imagination, and minimal time, use this year’s Gardening week to promote sales + increase impulse purchases. WBC Directors Andrew Wilson and Tim Wilkinson, have recently visited our #bagsforlife factories over in sunny Kolkata. So we wanted to remind you that our Youtube channel now features a series of short videos captured by them, which give fresh insight into the bags for life making process. While not quite David Attenborough, we do think you’ll find Tim’s voiceover not only exceedingly enticing, but perfectly describes the inner workings of factory life in India. It’s a unique perspective into the care and craftsmanship that goes into creating your perfect bags for life.